1 Brown ground beef in large nonstick skillet; drain. Add water; bring to a boil. 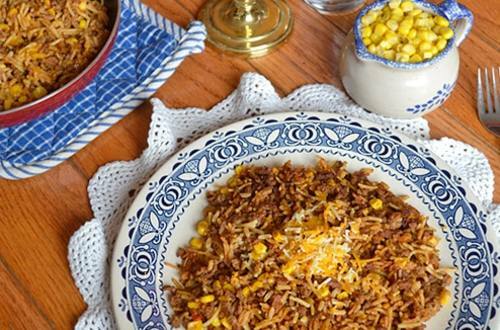 Stir in corn and Knorr® Fiesta Sides™ - Spanish Rice; bring to a boil. 2 Reduce heat and simmer uncovered, stirring occasionally, 10 minutes or until rice is tender. 3 Stir in 1/2 cup cheese until melted; top with remaining 1/4 cup cheese.